Claus Vogt writes: In 1999 Europe started a unique monetary experiment by introducing a common fiat currency, the euro. Today, the euro is legal tender in 22 countries. There are, however, huge disparities between the economies and policies of these countries, which makes for equally huge conflicts of interest. This was one of the main concerns of the euro’s opponents before its introduction. They argued that politicians would always be longing for inflationary “solutions” to every recession and crisis. And central bankers would always finally succumb to the wishes of their political masters, their independence being no more than a hollow promise … a sunshine agreement being abandoned on the first rainy day. It’s Obvious Now … How Right They Were! The EU passed the Stability and Growth Pact to silence the euro’s skeptics. Today, it’s dead and buried. 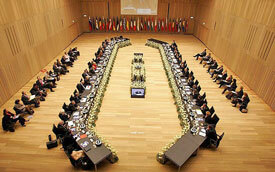 The euro’s critics were silenced by the introduction of the Stability and Growth Pact (SGP). According to pro-euro politicians, the SGP would limit the ability of governments to exert inflationary pressures on the European economy. And a national debt lower than 60 percent of GDP or approaching that value. But as soon as the first strong recession hit the continent, these rules were immediately abandoned! According to official estimates by the EU commission, the average annual budget deficit for all 27 EU countries will hit 6 percent for 2009 and 7.3 percent in 2010. The euro’s skeptics were dead right. Indeed, the silent burying of the SGP’s rules for growth and stability has an obvious implication: The euro members’ growth and stability is getting buried as well. This is a very dramatic development. Unfortunately history shows that once the rules are broken, governments usually do not restrain themselves again in the future. So for all intents and purposes, the SGP is gone and forgotten. As you can see on the chart below, the euro had some early problems after its introduction in 1999 when it fell from 118 to 80 against the U.S. dollar. But by 2008, it had shot up to 160! Then, during the culmination of the financial crisis, a sharp correction followed, from 160 to 125. Now the question is whether this is just a short to medium-term correction or something more. First, the low and falling personal saving rate in the U.S.
Second, the huge current account deficit. Take a look at the following two charts. The first shows the development of the U.S. personal saving rate, and the second the current account deficit. As you can see, from 2001 to 2008 (when the euro was rising against the dollar) the personal savings rate in the U.S. had declined while the current account deficit got much worse. But in 2008 both trends reversed sharply! In my opinion the rising saving rate and the declining current account deficit are structural trend changes. They are here to stay. That’s because they are the necessary and unavoidable reactions to the new reality of a post-real-estate-bubble world. This tells me that either the market does not believe in the durability of these trend changes, or the euro is in for a harsh awakening. In phase one, at the beginning of a trend, there are good fundamental reasons for a specific trend to establish itself. Later on, in phase two, market participants get used to this trend and take it as a given, lazily forgetting to monitor the fundamentals. Finally, in phase three, the fundamental reasons originally causing the trend, cease to exist. Yet the market somehow refuses to realize or acknowledge this new fact. This is when contrarians get interested … they pick up on the change in fundamentals and start betting on a trend change. I think that’s where we are right now, and it’s time for the dollar to rise against the euro. Gold Looks Better than Either the Euro OR the Dollar! Gold: The one stable and time-proven currency. In the bigger picture, the U.S. has the same economic problems as Europe. And both countries follow the very same fiscal and monetary policies of printing money and piling on government debts. These policies are principally bad for the stability of a currency. Hence, both the euro and the dollar should fall relative to gold. Back in 2001 you could buy an ounce of gold for $250. Today, it takes about $950. And the euro has tumbled almost as much: From €250 to €680 for an ounce of gold. So consider moving a piece of your portfolio out of the euro and the dollar and into the one stable and time-proven currency: Gold.